The city has nearly finished a project to improve sidewalks along Saliman Road between Seeliger Elementary School and Colorado St. Eleven corners were improved with ADA compliant ramps (which help everyone, not just the disabled), and some rough sections of sidewalk were replaced. The best part from a Safe Routes to School perspective is that the drain inlet which used to be right in the middle of the crosswalk over Saliman at Damon Road was moved to the north, out of the crosswalk. This drain inlet was in the worst possible place. It’s one of those drains which both scared you and fascinated you when you were a kid, not the kind of thing you want to face first thing in the morning on your way to school. 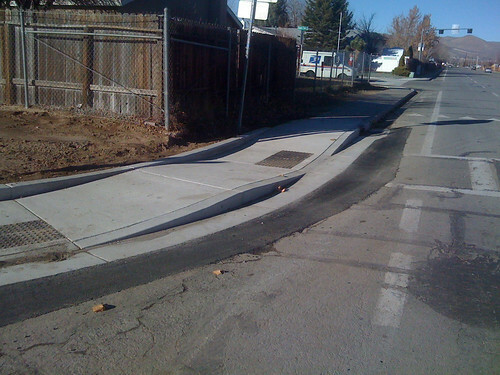 A big bravo to Carson City Public Works for this project, which was funding by the regular sidewalk repair program. 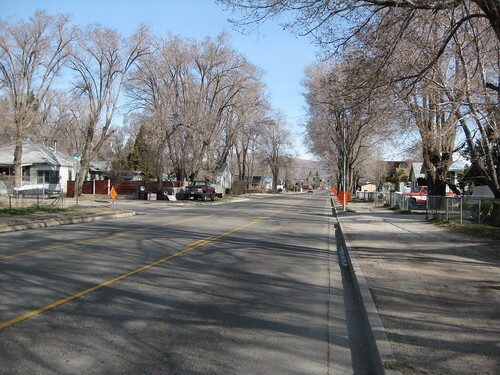 Patrick Pittenger, Transportation Manager at Carson City Public Works, provided a list of recent and future projects to improve sidewalks around Carson City. Fremont Elementary – Sidewalk widening and new connection to gate, about $16k from RTC, complete. Curry near Sophia – Install new detached sidewalk and curb ramps at request of local business, about $20k from RTC, complete. Washington – Sidewalk addition and improvements from Carson St to Roop St, about $306k from CDBG grant and about $13k from RTC, complete. Division/Spear – Remove old sidewalk and replace/upgrade and install corner ramps, about $6K from RTC and remainder from property owner, complete. Fifth and Goni – Sidewalk and bike lane additions on Fifth St between Fairview and Carson River Rd, and on Goni Rd between Arrowhead Dr and Conestoga Dr, CDBG grant, sidewalk work complete but landscaping now being added to Fifth St.
Bordewich Bray Elementary School celebrated Nevada Moves Day by organizing a walk from the old Boys & Girls Club location on Stewart St to the school with is at King St and Thompson St. About 50 students walked with Principal Valerie Dockery, other school staff, and a number of community volunteers. We’d like to see these walking school buses (students walking with one or more adults) happening every day, not just on special occasions. If you have work flexibility to walk with students to or from school, please get in touch with your school and ask how you can help. 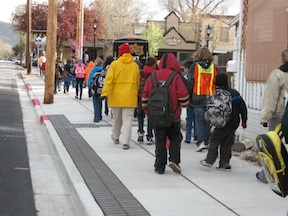 Bill Story, NDOT Bicycle and Pedestrian Program Coordinator, provided the photo showing the students walking, and showing the new sidewalk they are walking on along Curry St. Sidewalks along Curry, Fourth St, and Fifth St were recently repaired and replaced by Carson City Public Works, and provide a nicer and safer walking environment for everyone. A Nevada Appeal article on the walk is at http://www.nevadaappeal.com/article/20100429/NEWS/100429501. If you’ve been on Washington St recently, you’ve noticed major sidewalk work going on. This project by Carson City Public Works is funded by a $330K Community Development Block Grant. A sidewalk to the east of Roop St has already improved access to the Community Center and Aquatic Center, and sidewalks will be replaced or ADA curb cuts added from Carson St to Roop St, but the biggest part is the addition of sidewalks to the north side of Washington between Plaza St and Stewart St. There was formerly a deep drainage ditch and no sidewalk between the businesses and the Stewart St intersection. Already the drainage has been placed underground and sidewalk work is progressing. This project, in addition to improving the city’s compliance with ADA requirements, will provide a pedestrian friendly access between major community resources such as the community center, library, downtown, and businesses. Many of these sidewalks will not just be the required minimum five feet in width, but will be eight feet or more, welcoming pedestrian use. This project also complements the Safe Routes to School program as a number of middle school students use Washington on their way to Carson Middle School. Carson City Public Works recently rebuilt the sidewalks on Fourth St between Carson St and Curry St, as well as some nearby sidewalks along Fifth St and along Curry St. Years of neglect and tree roots had left the sidewalks almost unusable. It is sad to see the old large trees gone, but they were causing problems for not only sidewalks but sewer systems as well. Comma Coffee and its associated businesses just added chairs, tables and umbrellas to Fourth St, creating a little island of livability in downtown Carson City. There are several other places, particularly Firkin and Fox and Bella Fiore Wines on Third, and Doppelgangers at Curry and Proctor, where local businesses have turned their businesses outward to street seating and more involvement with pedestrians. These are small steps, but great to see. If you’d like to see more of these amenities in Carson City, please frequent the places that have them, and let them know why you are there! On March 10th, Muscle Powered attended the Carson City Regional Transportation Commission meeting to learn more about Phase 3 of the Roop Street Widening Project. This is the section of Roop Street that stretches from Washington Street to 5th Street. This phase won’t begin until after the phase that is currently under construction, Washington Street north to Beverly Drive, has been completed. Still, it is nice to know what the big picture is. 5′ striped bike lanes on each side of the road. 5′ sidewalks on each side of the road. 1′ concrete center divider curb. Left Turn Pockets at selected intersections. All three alternate plans were the same except where to build the left turn pockets. Alternate plan 3 was the most favorable with the left turn pockets at Washington, Musser, and 5th Streets. This was a compromise between making left turn pockets available at important intersections, while preserving front yards of residences near Robinson Street. I really like the idea of left turn pockets, since they don’t waste a lot of valuable space. This is especially important when retrofitting an already existing narrow corridor like Roop Street. A small percentage of traffic actually uses turn lanes, and only occupies the space near the intersections. The rest of the turn lane is just wasted space that could go to bike lanes and sidewalks. This section of Roop Street will present some challenges during reconstruction. While there are some wide sections that will make it easy for construction crews, other areas are very narrow. Right of way acquisitions for the project will intrude pretty far into some people’s yards, take out some fairly large trees, and will bring the sidewalk up very near the houses. I rode down Roop Street the day after the meeting to get a better look at the impact. Some areas wouldn’t be impacted greatly with the right of way acquisitions, businesses, parking lots, bare dirt, etc. The biggest impact was to about a half dozen houses on the east side of the road about half way down. These residents would lose much of their yards. The project is still quite a ways off though, and much can happen before construction. Will there be enough money left in the shrinking budget to continue? Will a shrinking Carson City population justify more auto capacity? In its current condition, it’s not safe to ride a bike down this part of Roop Street during many times of the day, and there are no sidewalks on many sections. Just adding bike lanes and sidewalks, and keeping the traffic down to two lanes would be a huge improvement. This would also create less of an impact for the residents, and probably save some of the big cottonwoods that provide shade for these properties. A good lesson I took away from this meeting is that we started a ripple effect last fall when we asked for bike lanes on Phase 2 of the Roop Street widening project. The planners knew that we would want bike lanes on Phase 3, and we didn’t even have to ask. None of us had to get up and speak during the meeting. All we had to do was nod and smile. 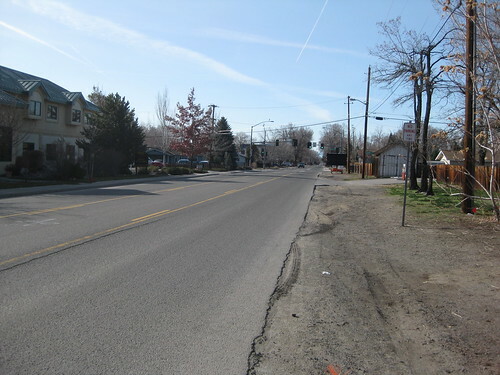 We’ve recently posted several project reports for bicycle and pedestrian projects completed in 2009 by Carson City Public Works, NDOT and Parks and Recreation, and others were posted throughout the year. Here is a list with links back to the original posts. Carson City Public Works also does ongoing sidewalk repair, which includes replacing buckled and deteriorated concrete, and adding ADA ramps. These projects are scattered about town. I don’t think that this ongoing work is keeping up with the rate of deterioration. A lot of sidewalks in Carson City were either constructed with poor quality materials or not cured properly, and they are falling apart. I believe that it ought to be the responsibility of the adjacent property owner to maintain their sidewalks in good repair, however, state law prevents local entities from requiring that owners do so. In addition, some bicycle lanes were restriped as part of the routine slurry seal and restriping that happens every year.